This lesson follows on logically from the major scale positions lesson, which gave us the patterns we needed to visualise the major scale across the entire fretboard, in simple steps. This lesson is about merging these position patterns together, to help us expand out of "box think" and allow us to play across as many as twelve frets in the same run/phrase. In other words, this lesson will show you a number of ways to play through the positions more fluidly, rather than breaking up the fretboard into small segments all the time. But remember, it's not just about soloing. These patterns also allow you to see blocks of major scale harmony (e.g. chord shapes) that you can use to embelish major key songs. With the position patterns, many of the strings only used two notes and we were confined to a small area of the fretboard. By merging these positions, however, we can create 3 notes per string patterns and play more quickly and economically across a wider area of the fretboard. Continuing the process of merging patterns, we can link together several 3 note per string patterns to cover even larger areas of the fretboard. When learning these patterns, pay special attention to the root note positions. This will help you locate the pattern in any key. 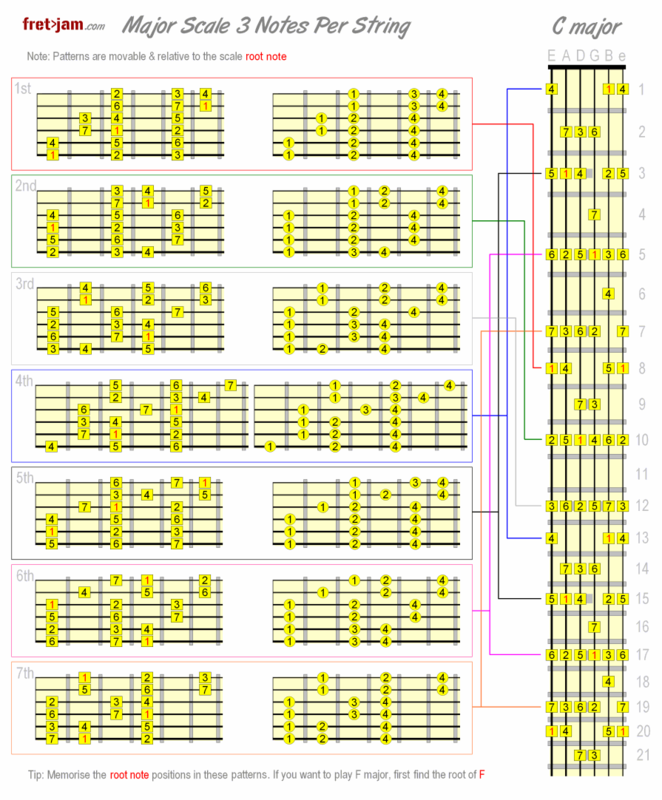 For example, if you wanted to play C# major, the 1 note in all these patterns would be positioned on C#. This pattern spans 12 frets and three octaves (for example if you just played the root/1 notes, you'd be playing through 3 octaves of that note). As you can see, we've merged the 1st, 2nd, 3rd and 4th position 3nps patterns. Try moving down the pattern as well. A great little exercise, both physically and mentally! We'll look at some more exercises that use these patterns in another lesson, but for now, try moving through the pattern in different ways. No rules, just explore the pattern freely in a number of different keys. The aim at this stage is to memorise the pattern and get it under your fingers. Remember, keep a close eye on those root notes - they will help you find your bearings within these larger patterns. For example, with the above pattern, if you found the root on the A string, you'd be able to visualise the pattern from that position (if you've memorised it!). See if you can build your own patterns by merging 3 note per string patterns, starting on different positions. The more ways in which you can test your knowledge of the major scale's intervals like this, the deeper it will be internalised. By combining scale positions, 3 notes per string and the wider patterns, we have countless ways to navigate through the scale. Again, the more combinations you play around with, the deeper this scale will become engrained in you mind. Then you'll have the roadmap for unrestricted, fluid soloing. Take a look at the below pattern. Here I've merged 3 notes per string through the 3rd position box pattern and then continuing with 3nps on the B and e strings. Eventually, you won't think in terms of breaking patterns down in such a calculated way - you'll start to move through it more spontaneously, and then, when you know it well enough, intuitively. Think of all this like a cab driver might learn the streets of a city. Eventually s/he knows the roadmap so well that s/he could take any number of routes to a given destination. When playing a scale, your "destination" is your next target note, and that's something we'll cover in future lessons. This is the crucial groundwork for that.